Since 1949, Dec 7 is observed as Armed Forces Flag Day throughout India to honour the martyrs. It is an important occasion to remind the Nation of its obligation to look after veterans, disabled soldiers, war widows and dependents of those who have sacrificed their lives for the safety, honour and integrity of India, said a statement of PIB (Defence Wing). The ‘Armed forces Flag Day Fund’ (AFFDF) has been constituted by the Govt of India for the welfare and rehabilitation of the Ex-Serv-icemen (ESM) community. There are more than 30 lakh ESM including 6.5 lakh widows. Contributions received from prospective donors of AFFDF are utilised to provide basis sustenance needs of the ESM community through a medium of welfare schemes. Several cashless payment methods have been setup and made available. 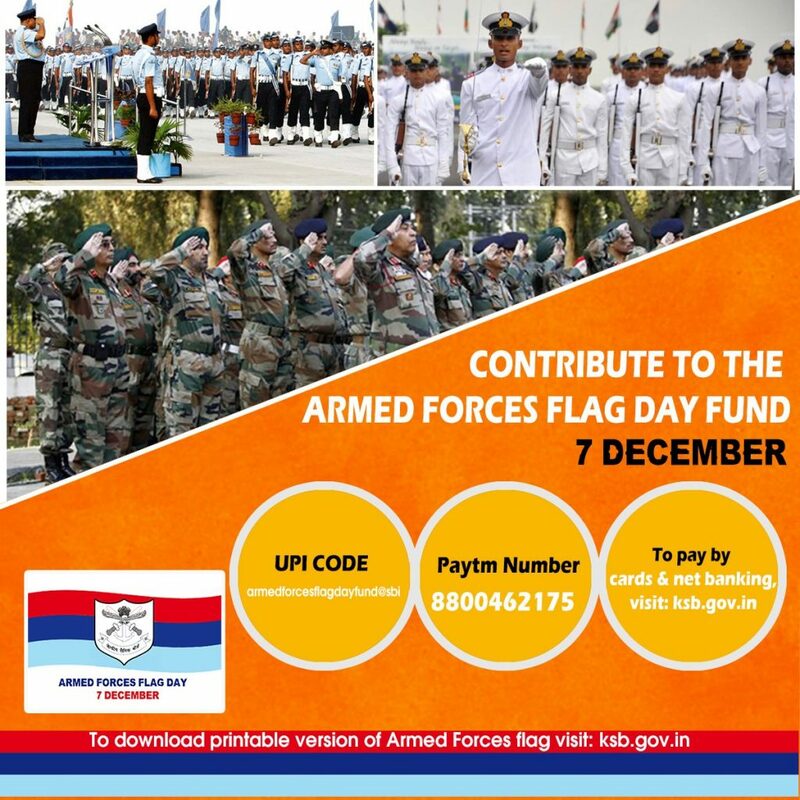 One can send their contributions via PayTM number ‘8800462175’ and UPI code: armedforcesflagdayfund@sbi – to contribute using Credit/Debit Card or Net Banking log on to ksb.gov.in/armed-forces-flag-day-fund.htm. These flags are available at all Govt offices. Alternatively, printable version of the flags can be downloaded from www.ksb.gov.in, said the statement. Next Post Why is Navy Day Celebrated on 4th December Every Year?